Beckett Entertainment Inc., a print publishing company that typically specializes in sports oriented magazines, has released a comprehensive guide to the history of horror films just in time for the Halloween season. “50 Scariest Movies: 100 Years of Horror Classics” is currently on newsstands internationally, and the cover sports our favourite slasher in prominence, Mr. Jason Voorhees (ok yes it is technically Roy from A New Beginning, but still reason to celebrate). The coverage within the pages of this tribute begins in 1920 with what is quoted as the “first true horror movie,” The Cabinet of Doctor Caligari and continues on a prominent role call directly up to 2008’s Let Me In. Each era is represented by a standout genre changer. The twenties sees the likes of Nosferatu and The Phantom of the Opera, with the Universal Monsters mostly representing the 1930s. Science Fiction offerings stand out in the ‘40s and ‘50s with the likes of The Thing from Another World and The Fly, leading to the shift in the ‘60s with range from Psycho to Night of the Living Dead. The Exorcist, Texas Chain Saw Massacre, Jaws and naturally Halloween changed the game again in the 1970s. Which leads us to the 1980s, and the spotlight turns to the now iconic Friday the 13th. With an article by Erin Masercola, the original film is praised for creating balance between camp and horror and as an endless influence on films, tv, books and all media since. Some trivia is also offered in the two page spread, including a list of sequels and spin-offs, credit to Kevin Bacon’s start in film and background on the real life endurances of original heroine Alice Hardy actress Adrienne King. The magazine goes on to count the flicks of influence throughout the ‘80s including A Nightmare on Elm St. and Aliens, the ‘90s including psychological shockers The Silence of the Lambs and The Sixth Sense, and finally the 2000s including American Psycho and 28 Days Later. While the contents will not shed any new light information wise for seasoned genre aficionados, it can serve a fun trip down memory lane at the shocks that have come before this Halloween season. 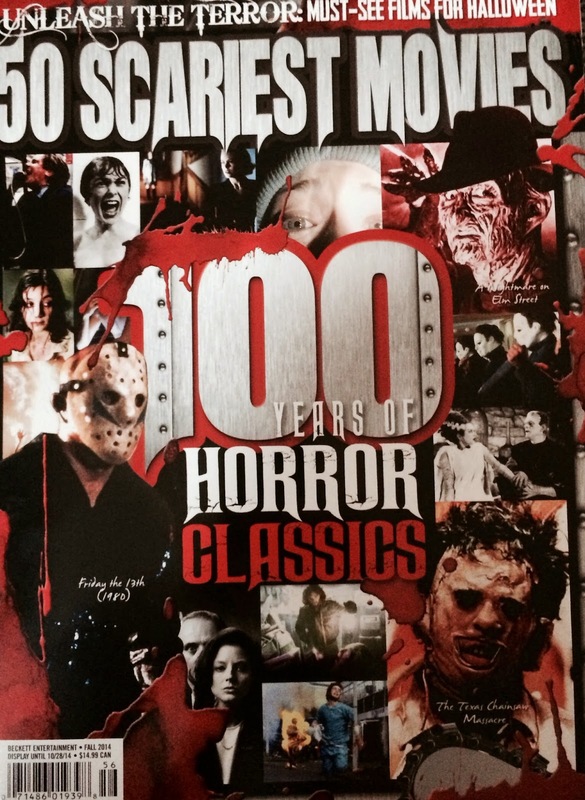 “50 Scariest Movies: 100 Years of Horror Classics” is available at most magazine retailers including Chapters and Indigo.